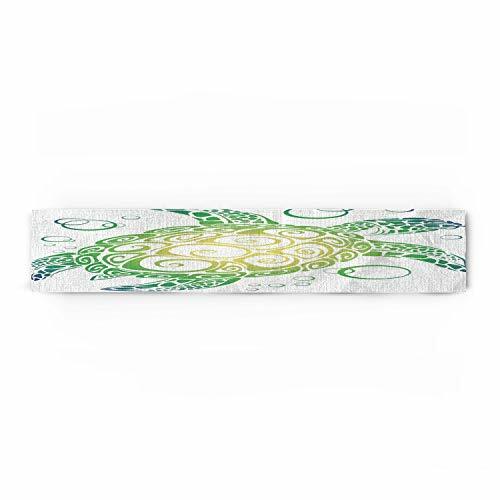 WAZZIT Sea Animal Lover Cotton Table Runner - Perfect for Summer Holiday Parties and Everyday Use 13x70inch, Cute Bubble Turtle Swimming by WAZZIT at Animal Backgrounds. MPN: CXC20180906LWAZZIT-SLEO00079ZQDALWT. Hurry! Limited time offer. Offer valid only while supplies last. A dining table is incomplete without a table runner. Runners are the perfect way to add some glamour as well as a stylish focal point for the table. A dining table is incomplete without a table runner. Runners are the perfect way to add some glamour as well as a stylish focal point for the table. They also offer a brilliant matching or contrast of colour with the tablecloth to set the right mood for casual as well as formal dining. Our table runners are available in a palette of colors, textures; and the elegance of pure linen will ensure you entertain in style! One-piece seamless design, folded over hemmed edges for an elegant looking table runner. Package includes - 1 Table runner. It is a single layer runner where the design is printed only on one side. Machine wash in cold water,it can be used long-time. If you have any questions about this product by WAZZIT, contact us by completing and submitting the form below. If you are looking for a specif part number, please include it with your message.